Part 2. 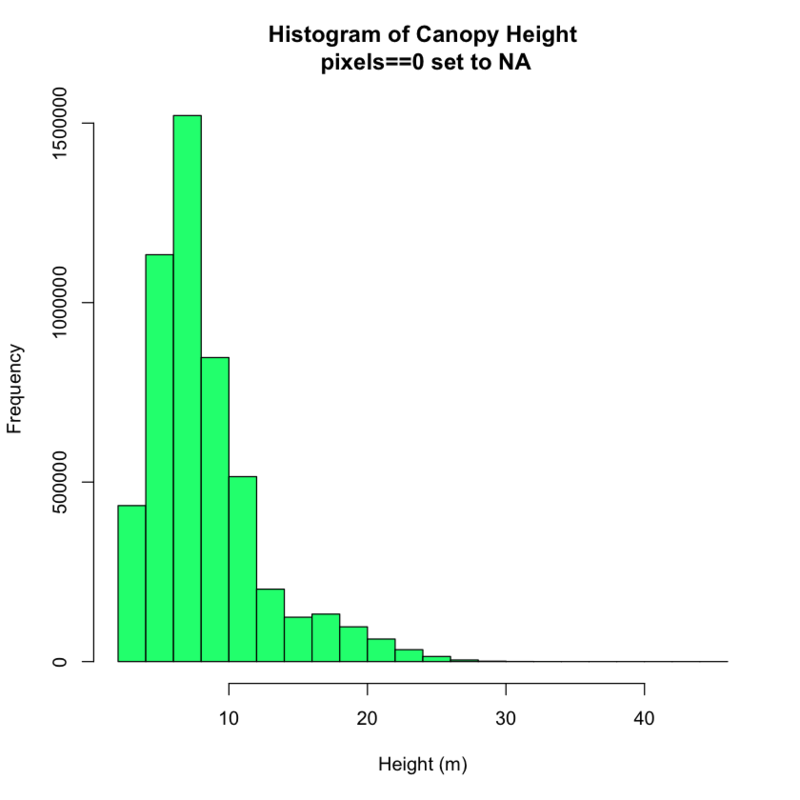 Does Your CHM Data Compare to Field Measured Tree Heights? Use the extract() function to extract raster values using a vector extent or set of extents. 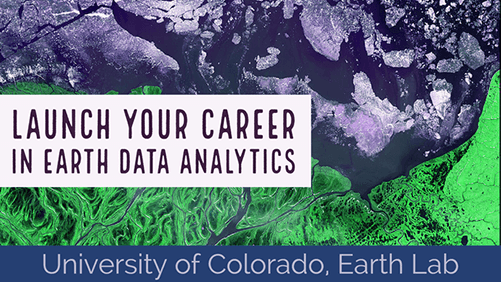 Create a scatter plot with a one-to-one line in R.
Understand the concept of uncertainty as it’s associated with remote sensing data. 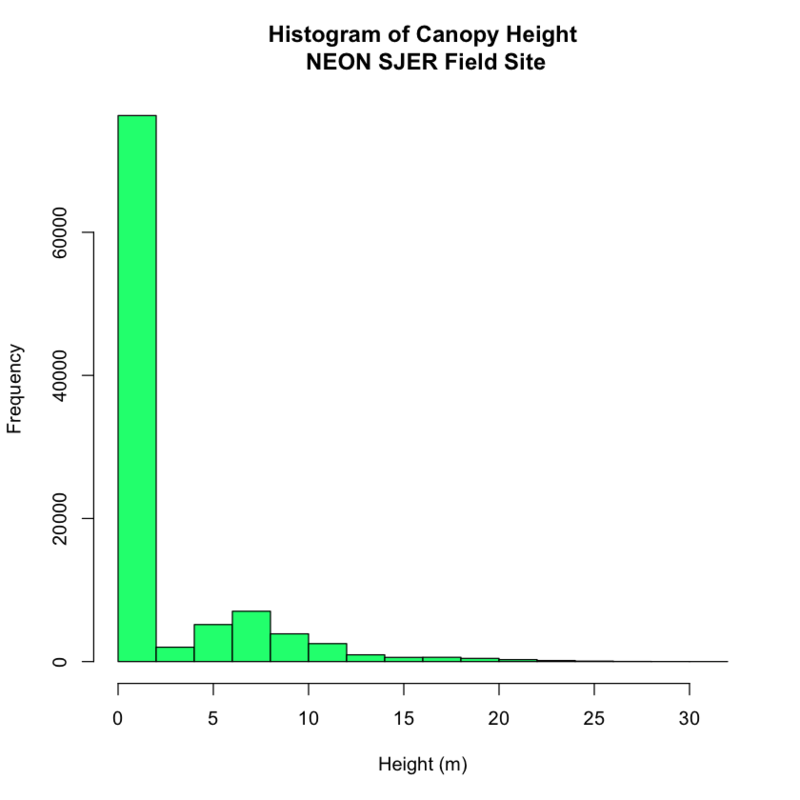 First, you will import a canopy height model created by the NEON project. In the previous lessons / weeks you learned how to make a canopy height model by subtracting the digital elevation model (DEM) from the digital surface model (DSM). # import canopy height model (CHM). ## 0% of the raster cells were used. 100000 values used. There are a lot of values in your CHM that == 0. Let’s set those to NA and plot again. You now have a canopy height model for your study area in California. However, how do the height values extracted from the CHM compare to your laboriously collected, field measured canopy height data? 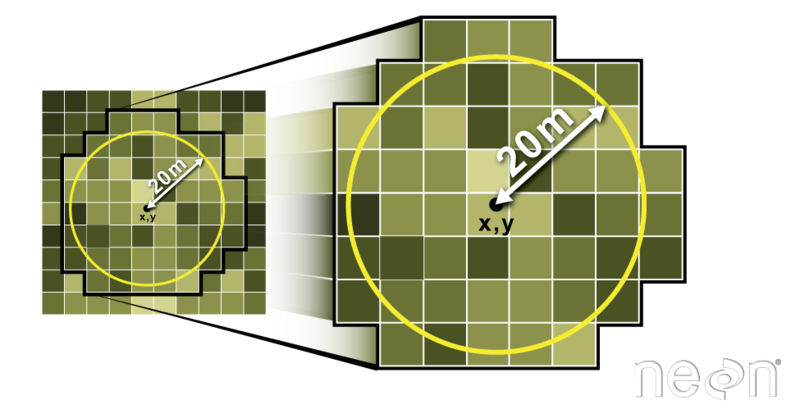 To figure this out, you will use in situ collected tree height data, measured within circular plots across your study area. You will compare the maximum measured tree height value to the maximum lidar derived height value for each circular plot using regression. For this activity, you will use the a csv (comma separate value) file, located in SJER/2013/insitu/veg_structure/D17_2013_SJER_vegStr.csv. ## Source: "/Users/lewa8222/Dropbox/earth-analytics/data/week-04/california/SJER/vector_data/SJER_plot_centroids.shp", layer: "SJER_plot_centroids"
Next, you will create a boundary region (called a buffer) representing the spatial extent of each plot (where trees were measured). 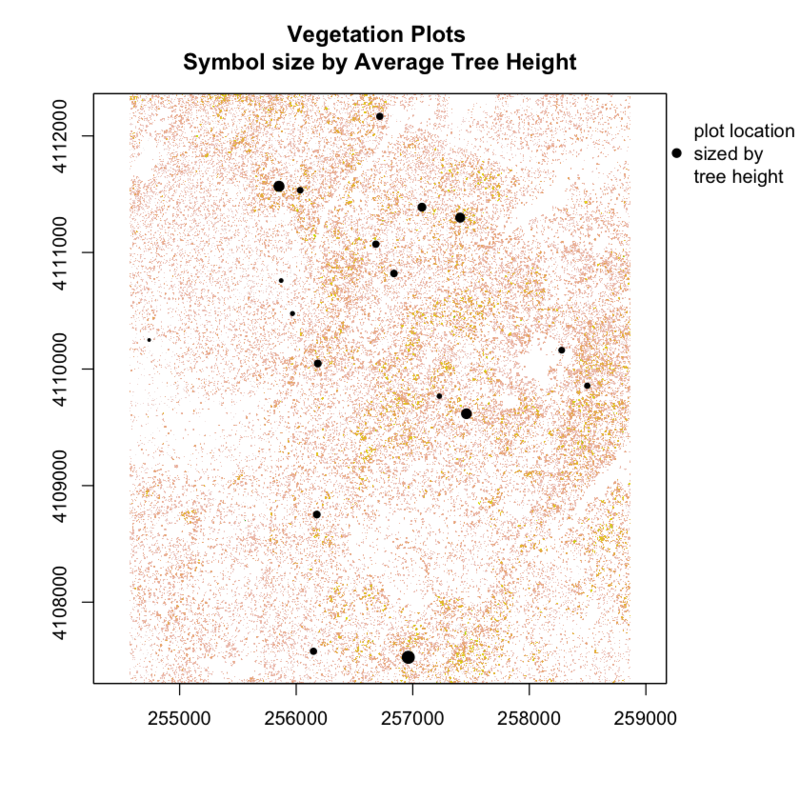 You will then extract all CHM pixels that fall within the plot boundary to use to estimate tree height for that plot. There are a few ways to go about this task. If your plots are circular, then you can use the extract() function. # Insitu sampling took place within 40m x 40m square plots, so you use a 20m radius. 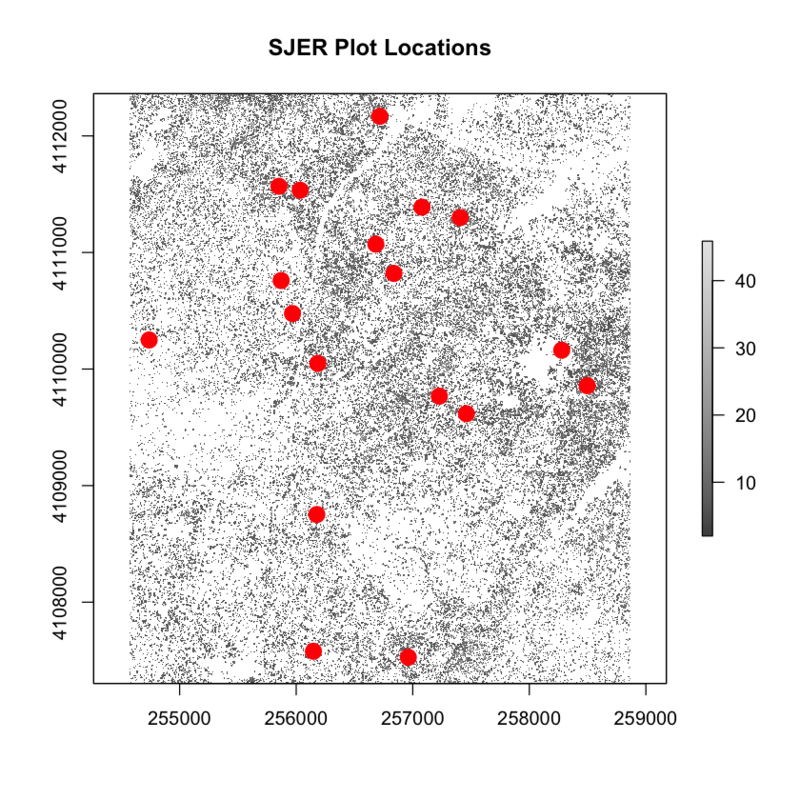 Looking at your new spatial points data frame, you can see a field named SJER_lidarCHM. This is the column name of the mean height for each plot location. Let’s rename that to be something more meaningful. If you want to explore the data distribution of pixel height values in each plot, you could remove the fun call to max and generate a list. cent_ovrList <- extract(chm,centroid_sp,buffer = 20). It’s good to look at the distribution of values you’ve extracted for each plot. Then you could generate a histogram for each plot hist(cent_ovrList[]). If you wanted, you could loop through several plots and create histograms using a for loop.